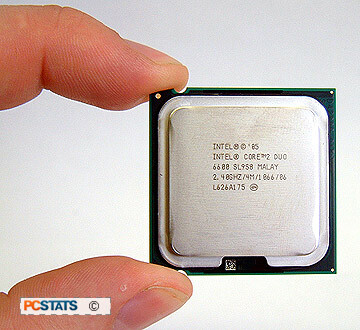 Intel Core 2 Duo E6600 PCSTATS Review - Intel Core 2 Duo E6600 Overclocking, lots of fun here! Abstract: All things considered equalled, enthusiasts like you are no doubt most attracted to the Intel Core 2 Duo E6600 because it offers the best mix of cache size and clock speed. Intel Core 2 Duo E6600 Overclocking, lots of fun here! The Intel Core 2 Duo has an excellent reputation for overclocking as you know and we have heard some fantastic stories even on stock cooling. By default the Core 2 Duo E6600 processor operates at 2.4 GHz with a 9x multiplier running on a 1066 MHz FSB. We've teamed this processor up with the Asus P5B Deluxe motherboard and a nice 2GB set of Corsair's Twin2X2048-6400C4 DDR2-800 memory. By default the Asus P5B Deluxe motherboard is clocked at 266 MHz FSB, and its speed will be increased in 5 MHz at a time. From the start the E6600 CPU was definitely up to our overclocking challenge! The system cracked through the 300 MHz FSB barrier (2.7 GHz CPU speed) without even breaking a sweat, with one FPU tied behind its back. At 2.84 GHz (315 MHz FSB) the Intel Core 2 Duo E6600 started to display some stability problems, increasing the CPU voltage to 1.25V solved this. The Core 2 Duo E6600 went past 3 GHz or 334 MHz FSB. Shortly there after, the voltage had to be increased again, this time to 1.3 V, to hit 3.2 GHz (356 MHz FSB). At this point the motherboard started to give us issues, increasing the Intel P965 Express voltage was then necessary. The E6600 was able to make it up to a whopping 3.4 GHz (378 MHz FSB) in the end! Both the chipset and CPU were running quite hot, additional cooling is definitely advised. Over the following page we'll be running the socket 775 Intel Core 2 Duo E6600 processor though PCSTATS standard set of gaming, productivity, and 64-bit processor benchmarks. There are a wide variety of gaming and synthetic benchmarks here to illustrate what kind of performance boost users can expect from these latest, dual core 64-bit processor. The specific details of how the Intel Core 2 Duo E6600 processor test systems were configured for benchmarking - including the hardware, software drivers, operating system and benchmark versions - are indicated below. In the third and fourth columns are the general specs for the AMD and Intel reference platforms that the dual core Core 2 Duo E6600 is being compared against. Please take a moment to look over PCSTATS test system configurations before moving on to the individual benchmark results on the next several pages. Pg 4. — Intel Core 2 Duo E6600 Overclocking, lots of fun here! Pg 15. Dual-Core Core 2 Duo is Coretastic!